Heritage Industrial Services, Inc. (Heritage) – a nationwide rigging and dismantling contractor, was contracted to perform rigging and installation of traffic control at the Lincoln Tunnel in preparation for Super Bowl XLVIII. The game was played on February 2, 2014, at MetLife Stadium at the Meadowlands Sports Complex in East Rutherford, New Jersey. New signage was needed in response to both unexpected traffic snarls as well as highly anticipated traffic congestion expected during the weeks leading up to Super Bowl 2014. It was expected that some 400,000 tourists would converge in the New York/New Jersey area during Super Bowl week, and 82,000 would flock to MetLife Stadium on game day. Heritage was contracted by the client not only based on its competitive bid but on their safety record and ability to perform this work under a tight schedule. 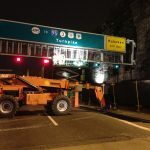 The new sign installation could not be done during the day due to heavy volumes of traffic that the Lincoln Tunnel experiences on a daily basis. Therefore, the work had to be conducted at night and finish before early morning rush hour. Safety was paramount and DOT night time safety precautions were taken including lighting, cones, reflective materials, warning lights, flaggers, etc. Heritage first had to first perform a lane closure by setting up cones and utilizing traffic control vehicles. 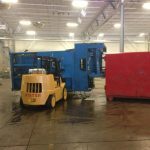 Once the lanes were closed, Heritage utilized the following equipment: 10K Lull, a 30 ft scissor lift and a 60’ size JLG articulated manlift, along with various rigging equipment The crew consisted of a total of 4 personal. The crew utilized the equipment to carefully remove the existing signs and then install the replacement signs. The entire project took 3 months to complete. The work was completed safely and within the allotted time.